True Book Addict...True to Books: Have you heard about TuesBookTalk on Twitter? If you would like to join us in reading and discussing The Little Stranger, we meet on Twitter at 11pm ET (10pm CT) every Tuesday. Hashtag to follow is #TuesBookTalk. 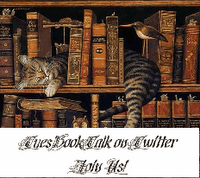 There is also a Twitter page to follow @TuesBookTalk. My Twitter handle is @truebookaddict if you have any questions or comments. So I was at Half Price bookstore today and I found Fingersmith and The Little Stranger there. Which to get, which to get? I had promised myself I would only buy one book (by the way that is soooo hard when the books are cheap!). In the end, I came away with this one. Then I open my Google reader and see this post. So excited. Now I just have to remember that I need to get on Twitter on Tuesdays! I look forward to this discussion. I think I'm the only one that didn't love this book! I'm still waiting on my book but I'll be there. Lisa--Yay! I'm so excited to have you join us. What a coincidence that you decided to buy that book! Ryan--I hope you get your book soon! I need to get my hands on this book! I think it looks fantastic! I would love to have joined you if I would have had the book read. Hi Michelle! I love the way you have this post up. It looks great! I have bad news though, I am going to have to pass on this book and discussion. I sat down with my husband to talk over some things, with the change of weather upon us. With a few things we have going here and the cleaning up to do from the ugly winter we had, it is looking as my reading time may get cut back some. :( I am sorry. I am hoping to get through the next month or two and be back full reading time. You all are going to have to let me know how the book is. I hope you all enjoy it. Let me know what the next book is too. Sheila--you are welcome to join us. We are reading two chapters at a time weekly, if you think you could get the book (at the library maybe) and join us on Tuesday, we would love to have you! Mel--Oh darn! We sure will miss you. But I completely understand. I'm thinking about getting some spring cleaning, etc. done around here myself. I'll let you know when I pick our next book!